Because of the numerous targets of microRNAs (miRNAs), functional dissection of specific miRNA/mRNA interactions is important to understand the complex miRNA regulatory mechanisms. Glycoprotein A repetitions predominant (GARP) is specifically expressed on regulatory CD25+ CD4 T cells upon their activation. GARP has a long 3′ untranslated region containing five highly conserved regions suggesting miRNA regulation of its expression. Although GARP is physiologically expressed on a cell subset characterized by stringent control of proliferation, amplification of the GARP gene has been found in many tumors characterized by uncontrolled proliferation. In this study, we investigated in detail miRNA regulation of GARP expression, in particular by miR-142-3p, and dissected the functional outcome of miR-142-3p/GARP mRNA interaction. 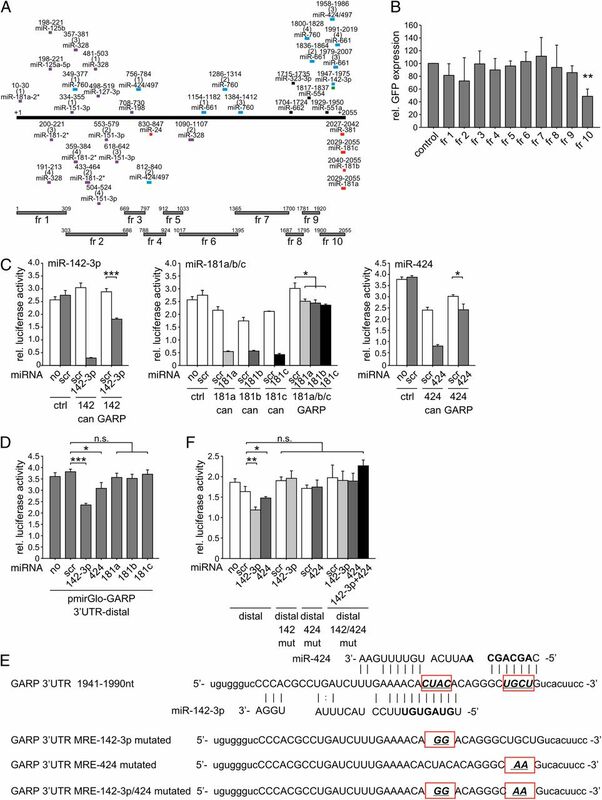 We demonstrate that miR-142-3p binds directly to the 3′ untranslated region of GARP and represses GARP protein expression by Argonaute 2–associated degradation of GARP mRNA. Functionally, miR-142-3p–mediated regulation of GARP is involved in the expansion of CD25+ CD4 T cells in response to stimulation. The data indicate that miR-142-3p regulates GARP expression on CD25+ CD4 T cells and, as a result, their expansion in response to activation. Our data provide novel insight into the molecular mechanisms controlling regulatory T cell expansion. They may also have implications for understanding tumor cell biology. The importance of posttranscriptional silencing pathways, in particular those involving microRNAs (miRNAs), in many biological processes has been recently highlighted. miRNAs are endogenous ∼23 nt RNAs that pair to the 3′ untranslated region (UTR) of protein-coding genes to direct their posttranslational repression (1). The expression of miRNAs is often subject to regulation in response to cellular stimulation to allow for precise gene expression in different cell types and under different conditions (2, 3). The finding that inactivation of miRNA biogenesis by the deletion of the RNase III endonuclease Dicer leads to prenatal lethality in mice demonstrates the crucial importance of miRNAs in mammal development (4). The role of miRNAs during development has been attributed to differentiation of stem cells and the formation of different tissues (5). Additionally, differentiation of the immune system as well as effector functions of immune cells are centrally regulated by miRNAs (6). Lineage-specific deletion of Dicer leads to compromised T cell development (7, 8) and a developmental block at the pro– to pre–B cell transition in B cell maturation (9). Heretofore, miR-17-92, -181a, and -150 have been identified as specific miRNAs directly regulating T and B cell lineage development (9–11), whereas miRNA-155 and miRNA-182 have been identified as specific miRNAs necessary for clonal expansion of activated effector CD4 T cells and for eliciting effector functions of T and B cells (12–14). The central involvement of miRNAs in regulation of the optimal evolution of an immune response became apparent by analysis of the effect of a Dicer knockout on regulatory T cells. Conditional deletion of Dicer in CD4 T cells or further in regulatory T cells diminished the numbers of regulatory T cells and resulted in severe autoimmunity in mice (15, 16). Dissection of the network of individual miRNAs and their gene targets leading to this phenotype is the subject of current investigation. Leucine-rich repeat containing 32, also known as glycoprotein A repetitions predominant (GARP), is a member of the leucine-rich repeat family that exhibits evolutionary similarity to TLRs (17). GARP is specifically expressed by regulatory CD25+ CD4 T cells in response to activation (18). The 2-kb-long 3′UTR of GARP contains five highly conserved regions (Supplemental Fig. 1). Conservation in the 3′UTR is indicative of the presence of evolutionarily selected, important regulatory sequences such as miRNA recognition sites (19). Considering this, the possibility of miRNA involvement in the regulation of GARP expression is likely. GARP has been proposed to serve as a receptor for latent TGF-β, although the relevance of this receptor/ligand interaction is not clear (20, 21). Interestingly, numerous studies have reported an amplification of the GARP gene in tumors, in particular in those with an invasive, metastasizing or treatment-resistant potential, suggesting a role of this gene product in regulating aggressive tumor biology once deregulated (22–29). Clarification of GARP miRNA regulation might therefore have an implication in determining the role of GARP and its regulatory miRNAs in immune responses. Moreover, it might be useful for understanding the pathogenesis of aggressive behavior of certain tumors. In this study, we report that GARP expression is miRNA regulated. We identified miR-142-3p as the miRNA regulating GARP expression in CD4 CD25+ T cells. The miR-142-3p–mediated regulation of GARP expression correlated with the expansion of CD4 CD25+ T cells in response to activation. Our report provides new insight into the function of miR-142-3p during regulatory T cell effector function and delineates a possible role of miR-142-3p in the control of regulatory T cell homeostasis. Monoclonal FITC-labeled anti–CD3/PE-labeled anti-CD4 dual Tag Ab (UCHT-1/Q4120; Sigma-Aldrich, St. Louis, MO), FITC-labeled anti-CD4 (Q4120; Sigma-Aldrich), and PE-labeled anti-CD25 Ab (M-A251; BD Pharmingen, San Jose, CA) were used for control of purification of CD25+ and CD25− CD4 T cells. For the surface GARP staining, monoclonal rat anti-human GARP Ab (clone 7H2) was used. PE-labeled anti-rat Igs (IgG) (Sigma-Aldrich) were used for detection. For ribonucleoprotein (RNP) immunoprecipitation (IP), anti-human Ago1 and anti-human Ago2 (provided by Dr. G. Meister, Regensburg, Germany) were used. Rat IgG (Sigma-Aldrich) was used as control for IP. Human embryonic kidney (HEK)293 cells and the T cell leukemia line (Jurkat) were from the American Type Culture Collection. HEK293 cells were cultivated twice a week with DMEM supplemented with 10% FCS, penicillin G (50 U/ml), and 50 μg/ml streptomycin (all from Life Technologies Invitrogen, Carlsbad, CA). Jurkat cells were maintained in RPMI 1640 supplemented with 10% FCS, penicillin G (50 U/ml), and 50 μg/ml streptomycin (all from Life Technologies Invitrogen). Rats were immunized with 5 × 107 Rat-2 cells overexpressing human GARP. Fusion was performed using standard procedures. Supernatants were tested by FACS on transfected HeLa cells expressing GARP. Clone 7H2 (IgG2a) was used in this study. CD25+ and CD25− CD4 T cells were purified from human PBMCs by a human CD4+CD25+ regulatory T cell isolation kit (Miltenyi Biotec, Bergisch Gladbach, Germany). Where indicated, T cells were stimulated with anti–CD3/28-coated beads (Dynabeads human T-activator CD3/CD28; Life Technologies Invitrogen) and 100 resonance units/ml recombinant human IL-2 (Chiron, Emeryville, CA). All donors provided written informed consent. The study was approved by the Ethics Committee of the University of Munich. Total RNA was extracted using the RNeasy Plus Mini kit (Qiagen, Hilden, Germany) following the manufacturer’s instructions. One microgram was reverse transcribed into cDNA by avian myeloblastosis virus reverse transcriptase (Promega, Mannheim, Germany) in 50 mM Tris-HCl (pH 8.3), 50 mM KCl, 10 mM MgCl2, 0.5 mM spermidine, and 10 mM DTT for 1 h at 42°C. GARP mRNA, miR-142-3p, and miR-424 were detected using TaqMan assays (hs00194136_m1, 000464, and 000604, respectively; Applied Biosystems, Carlsbad, CA). RNU6B was used as an endogenous miRNA control (001093; Applied Biosystems). miRNA mimics (negative control CN-00100, miR-142-3p C-300610, miR-181a C-300552, miR-181b C-300554, miR-181c C-300556, miR-381 C-300690, miR-424 C-300717, miR-497 C-300765, miR-551a C-300868, miR-661 C-300981, miR-662 C-300982) and miRNA hairpin inhibitors, antagomirs (negative control IN-001005, inhibitor miR-142-3p IH-300610, and inhibitor miR-424 IH-300717), were purchased from (Dharmacon/Thermo Scientific, Lafayette, CO). Forward (5′-CACCATGAGACCCCAGATCCTGC-3′) and reverse (5′-TTAGGCTTTATAGTGTTGGTTAAAC-3′) primers were used for GARP coding sequence amplification. Kozak sequence was introduced into the forward primer for direct cloning into the pcDNA3.1 vector (Life Technologies Invitrogen). Forward (5′-CTCGAGAGAAGCCGGGAGAC-3′) and reverse (5′-CCGCGGACATTCAGGTAGG-3′) primers were used for GARP 3′UTR amplification. Restriction sites of XhoI and SacII shown underlined were introduced into the forward and reverse primers, respectively, for consecutive cloning steps. The PCR products for the GARP coding sequence and the 3′UTR were cloned directly into either a pcDNA3.1 or pCR2.1 TOPO vector (Life Technologies Invitrogen), respectively. Cloned sequences were confirmed by sequencing. The GARP 3′UTR fragment was released from the pCR2.1-GARP-3′UTR vector using XhoI and SacII restriction endonucleases (New England Biolabs, Ipswich, MA) and inserted into the pcDNA3.1-GARP coding sequence vector between XhoI and SacII sites. Overlapping fragments of the GARP 3′UTR were amplified from pCR2.1-GARP-3′UTR and cloned into pmirGlo (Promega) downstream of the luciferase sequence or into pEGFP-C1* which was modified to contain a stop codon at the 3′ end of GFP open reading frame. Primer pairs for fragment amplification were designed to contain a PmeI restriction site in the forward primer and a SalI restriction site in the reverse primer sites. Perfect matching sequences of miRNAs (canonical miRNA recognition elements [MREs]), predicted MREs of miRNAs within the GARP 3′UTR (GARP MREs), or mutated GARP MREs and their complementary strand were synthesized as single-stranded 20-nt oligonucleotides by Eurofins MWG Operon (Ebersberg, Germany). Complementary oligonucleotides were annealed and cloned into pmirGlo vectors downstream of the luciferase gene. For subsequent cloning, overhangs generating a PmeI restriction site (sense oligonucleotide, 5′-AAAC, antisense oligonucleotide, 5′-TTTG) and an NheI restriction site (sense oligonucleotide, 5′-G, antisense oligonucleotide, 5′-CTAGC) were introduced at the 5′ and 3′ end of the oligonucleotides, respectively. Additionally, a NotI restriction site was introduced into the oligonucleotides for clone selection. To silence GARP expression in GARP-expressing HeLa cell clones, in silico–generated GARP-targeting small interfering RNA (siRNA) or scrambled siRNA (Life Technologies Invitrogen) were cloned into the pcDNA6.2-GW/EmGFP miRNA expression vector (Life Technologies Invitrogen). HEK293 cells (50,000) were transfected with 50 ng pmirGlo constructs and 25 nM miRNA mimics or 250 nM antagomirs, using lipofectamin (Life Technologies Invitrogen). CD25+ CD4 T cells were transfected with 1 μg DNA and 250 nM antagomirs using an Amaxa human T cell Nucleofector kit (Lonza, Cologne, Germany). Twenty-four hours after transfection, luciferase activity was measured using a Dual-Glo luciferase assay (Promega). CD25+ or CD25− CD4 T cells were labeled with 10 μM CFSE (Life Technologies Invitrogen). Where indicated, T cells were transfected with 250 nM antagomirs, 25 nM miRNA mimics, or 2–4 μg vector of interest and cotransfected with 1 μg pDsRed2-N1 (Miltenyi Biotec). When proliferation of vector-transfected T cells was evaluated, CFSE dilution was followed in Red2-expressing T cells. RNP IP was performed based on the protocol by Beitzinger and Meister (30). Cells were synchronized in the G1/S boundary by double thymidine block (2 mM thymidine; Sigma-Aldrich), released for up to 48 h, and analyzed after propidium iodide staining by FACS using the CycleTest Plus DNA reagent kit (BD Pharmingen). HeLa cell lysates were separated in a 7% polyacrylamide gel and transferred onto nitrocellulose. The blots were probed with specific Abs for GARP, actin (Sigma-Aldrich), p53 (DO-1; Calbiochem, Bad Soden, Germany), p21/Cip1, or p27/Kip1 (New England Biolabs) and developed with ECL. HeLa cells were seeded onto microscope slides, stained with DAPI, FITC-labeled anti-CD3 (both Sigma-Aldrich), or the GARP antiserum followed by biotin-conjugated goat anti-rabbit IgG and cyanine 5–labeled streptavidin (Dianova, Hamburg, Germany). Images were captured on the Leica TCS SP5 confocal laser scanning microscope (Leica Microsystems, Heidelberg, Germany). Based on the distribution of predicted MREs within the GARP 3′UTR, 10 fragments of the GARP 3′UTR were cloned separately into the pEGFP reporter vector downstream of the GFP coding sequence (Fig. 1A). The influence of the inserted sequences on GFP expression in CD25+ CD4 T cells was evaluated by flow cytometry as shown in Fig. 1B. Of the 10 constructs, only the vector containing the distal part of the GARP 3′UTR (fragment 10) showed significantly lower GFP expression indicating the presence of sequences capable of posttranscriptional regulation of protein expression. miR-142-3p and miR-424 recognize their MREs within the GARP 3′UTR. (A) Schematic presentation of the GARP 3′UTR. In silico predicted miRNA binding sites in the 3′UTR of GARP mRNA are shown as dashes. Positions are indicated by the nucleotide numbers indicated above. Numbers in parentheses indicate the running number of MREs when more than one was predicted. Eleven miRNAs were predicted by miRbase target (purple; http://www.mirbase.org), five by Diana Lab (blue; http://diana.cslab.ece.ntua.gr/micro), five by Pictar (red; http://pictar.mdc-berlin.de), and one by Target Scan (green; http://targetscan.org). The full-length GARP 3′UTR was subdivided into 10 overlapping fragments. (B) Fragments 1–10 were cloned into the pEGFP vector downstream of the GFP gene and transfected into freshly isolated CD25+ CD4 T cells. Mean fluorescence intensity of GFP was analyzed 24 h after transfection by flow cytometry. Results were normalized to the value of cells transfected with a control vector without an insert. Statistical analysis was performed by a Student t test. (C) MREs for miR-142-3p, miR-181a, miR-181b, miR-181c, and miR-424 predicted in the distal part of the GARP 3′UTR were cloned into the pmirGlo luciferase reporter vector downstream of the firefly luciferase gene and cotransfected with 25 nM miRNA or scrambled miRNA (scr) into HEK293 cells. Luciferase activity was analyzed 24 h after transfection. Vectors containing canonical sequences of MREs (can) and the pmirGlo vector without an insert (ctrl) were used as positive and negative controls, respectively. (D) The pmirGlo luciferase reporter vector containing the distal 400-bp fragment of the GARP 3′UTR downstream of the firefly luciferase gene was cotransfected with 25 nM miR-142-3p, miR-181a, miR-181b, miR-181c, or miR-424 miRNA or with scrambled miRNA into HEK293 cells. Luciferase activity was analyzed 24 h after transfection. (E) Mutations in the region complementary to the seed sequence (shown in bold) of miR-142-3p and/or miR-424 were generated by site-directed mutagenesis as indicated. (F) pmirGlo luciferase reporter vectors containing the distal 400-bp fragment of the GARP 3′UTR with mutated binding sites as shown in (E) were cotransfected with miRNA mimics into HEK293 cells. Luciferase activity was analyzed 24 h afterward. Means ± SD of at least three experiments are shown. Statistical analysis was performed by ANOVA. *p < 0.05, **p < 0.01, ***p < 0.001. To dissect whether and which miRNAs can recognize fragment 10 of the GARP 3′UTR to foster posttranscriptional regulation, MREs of nine miRNAs predicted by in silico analysis to be localized within this fragment (miR-142-3p, miR-181a, miR-181b, miR-181c, miR-381, miR-424, miR-497, miR-551, and miR-661) were cloned separately into the pmirGlo luciferase reporter vector downstream of the luciferase gene. For control, reporter vectors containing complementary sequences of miRNAs (canonical MREs) were used. Luciferase activity was measured after cotransfection of miRNA mimics and the respective vectors into HEK293 cells. Cotransfection of miR-142-3p, miR-181a/b/c, and miR-424 with the respective vectors resulted in a significant reduction of luciferase activity, indicating that these miRNAs indeed recognized their predicted MREs (Fig. 1C). In contrast, miR-381, miR-497, miR-551, and miR-661 mimics did not influence reporter gene expression (Supplemental Fig. 2). Next, we examined the putative miRNA binding in the context of the GARP 3′UTR by using a luciferase vector containing an ∼400-bp DNA fragment comprising the distal part of the GARP 3′UTR. Cotransfection of this vector with miRNA mimics of either miR-142-3p or miR-424 into HEK293 cells showed reduced luciferase activity, whereas mimics of miR-181a, miR-181b, or miR-181c did not have an effect on reporter gene expression (Fig. 1D). When MREs for miR-142-3p and miR-424 were mutated as shown in Fig. 1E, the inhibitory effect of the mimics was abrogated, confirming the specificity of miRNA/mRNA binding (Fig. 1F). Importantly, only a single putative recognition site for miR-142-3p was predicted within the full-length GARP 3′UTR. miR-142-3p has previously been reported to be expressed in CD25+ CD4 T cells (31). Analysis of the expression of miR-142-3p and of miR-424 in the current system confirmed the expression of miR-142-3p in CD25+ CD4 T cells and CD25− CD4 T cells and revealed low expression levels of miR-424 in CD4 T cells (Fig. 2A). We then analyzed the effect of both endogenously expressed miRNAs on the luciferase activity of the vectors. Transfection of CD25+ CD4 T cells with a vector containing just the predicted GARP miR-142-3p MRE without any cotransfection resulted in diminished luciferase activity as compared with the control vector (Fig. 2B). Transfection with the vector containing the miR-424 MRE yielded luciferase activity similar to that of the control vector (Fig. 2B). These findings indicate that miR-142-3p is expressed endogenously to a sufficient extent to downmodulate expression of the reporter gene, whereas endogenous expression of miR-424 is not sufficient to regulate the reporter gene construct. Indeed, inhibition of the biological activity of miR-142-3p by cotransfection with an antagomir to miR-142-3p restored the luciferase activity of the miR-142-3p MRE vector, whereas inhibition of miR-424 biological activity had no effect on the activity of the miR-424 MRE reporter gene construct (Fig. 2B). Endogenously expressed miR-142-3p interacts with its MRE in the GARP 3′UTR in CD25+ CD4 T cells. (A) Expression of miR-142-3p and miR-424 was determined in CD25+ and CD25− CD4 T cells by real-time PCR using TaqMan miRNA assays. Relative expression of miR-142-3p compared with RNU6B is demonstrated. Means ± SD of three independent experiments are shown. (B and C) CD25+ CD4 T cells activated for 3 d with anti-CD3/CD28 dynabeads were transfected with pmirGlo vectors containing miR-142-3p or miR-424 MREs predicted in the GARP 3′UTR (B) or the distal fragment of the GARP 3′UTR (fragment 10), wild type or mutated as shown in Fig. 1E (C), and cotransfected with appropriate specific or scrambled (scr) antagomirs as control. Luciferase activity was analyzed 24 h after transfection. The pmirGlo vector without an insert (ctrl) was used as control. Results are demonstrated as means ± SEM of four experiments (right panel) or as one representative of two independent experiments with similar outcome (left panel). Statistical analyses were performed by a Student t test. *p < 0.05, **p < 0.01, ***p < 0.001. In additional experiments, transfection of the distal part of the GARP 3′UTR alone into CD25+ CD4 T cells led to diminished activity of the reporter gene as compared with transfection of a control reporter gene construct without the GARP 3′UTR (Fig. 2C). Cotransfection of the GARP 3′UTR reporter vector with an antagomir to miR-142-3p or mutation of the putative miR-142-3p MRE in the GARP 3′UTR restored the luciferase activity of the vector (Fig. 2C). In contrast, neither inhibition of miR-424 biological activity nor mutation of its binding site could restore luciferase activity (Fig. 2C). Thus, the data identify miR-142-3p as the miRNA involved in posttranscriptional regulation of GARP expression in CD25+ CD4 T cells. The seed region of miR-142-3p (GUAGUGU) perfectly matches the predicted miR-142-3p MRE in the GARP 3′UTR (Fig. 1E), indicating that the inhibition of GARP expression via miR-142-3p may occur through Argonaute (Ago)2–mediated mRNA cleavage (32). Thus, we performed RNP IP using Abs against Ago1 and Ago2. Both GARP mRNA and miR-142-3p were immunoprecipitated together with Ago2 from Jurkat cells transfected with a vector containing the GARP coding sequence followed by the GARP 3′UTR. GARP mRNA was detected only in the Ago2 immunoprecipitates, whereas miR-142-3p was present in both Ago1- and Ago2-containing RNP complexes, as expected (Fig. 3A). 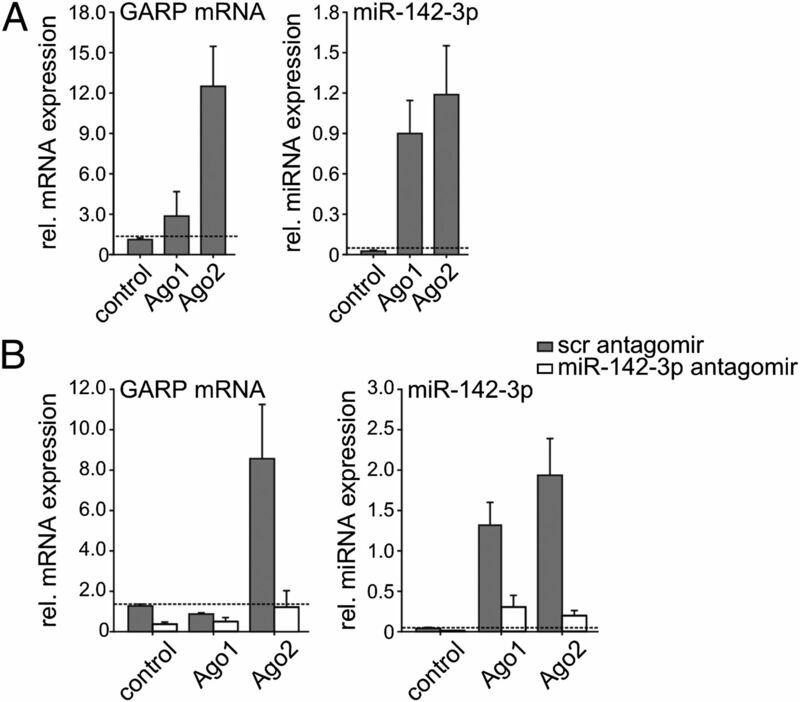 To dissect the simultaneous occurrence of miR-142-3p and GARP mRNA in the Ago2-containing RNP complex, biological activity of miR-142-3p was inhibited by an antagomir. Cotransfection with an antagomir to miR-142-3p prevented GARP mRNA loading into the Ago2-associated RNP complex, whereas miR-142-3p loading into both Ago1 and Ago2 RNPs was prevented (Fig. 3B), confirming that miR-142-3p mediates loading of GARP mRNA into the Ago2-associated RNA-induced silencing complex (RISC). Thus, posttranscriptional regulation of GARP expression involves miR-142-3p–mediated recruitment of GARP mRNA into the Ago2-associated RISC. Downregulation of GARP expression is mediated via the Ago2-associated pathway. The GARP coding sequence and the GARP 3′UTR were sequentially cloned into the pcDNA3.1 vector and transfected into Jurkat cells. (A) Endogenous ribonucleoproteins were immunoprecipitated with anti-Ago1 or anti-Ago2 Abs 24 h after transfection. Isotype IgG was used as a control. (B) To evaluate the involvement of miR-142-3p, cells were cotransfected with an antagomir to miR-142-3p or with a scrambled antagomir. RNA was isolated, reverse transcribed, and analyzed by real-time PCR for GARP mRNA or miR-142-3p. Relative expression normalized to input is demonstrated. Mean values ± SEM of five (A) or four (B) independent experiments are shown. Dashed lines indicate the background of the assay determined as means ± SD from immunoprecipitations with isotype control. We next investigated expression of GARP and miR-142-3p in CD25+ CD4 T cells in response to activation. GARP mRNA and protein expression were upregulated within 24 h in CD25+ CD4 T cells in response to activation and disappeared 3 d later (Fig. 4A), consistent with the loading of GARP mRNA into the Ago2-associated RISC responsible for mRNA cleavage (Fig. 3). miR-142-3p was also markedly upregulated in response to T cell activation; however, upregulation was first noted at day 2 after stimulation and diminished the following day (Fig. 4A). The upregulation of miR-142-3p in response to CD25+ CD4 T cell activation occurred after the upregulation of GARP mRNA and immediately preceded its downmodulation. 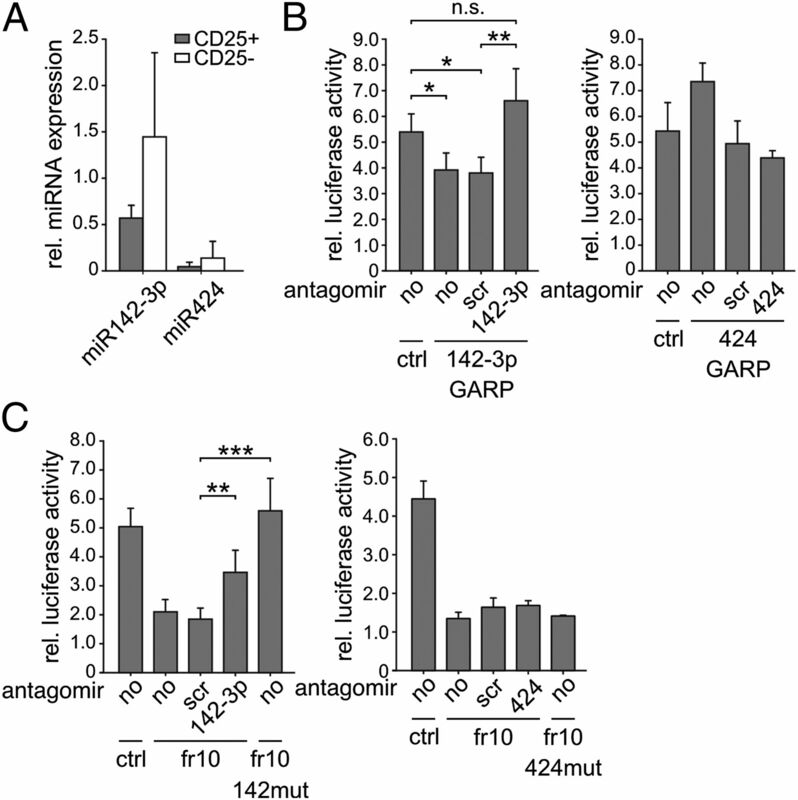 Endogenous miR-142-3p controls GARP expression on CD25+ CD4 T cells. CD25+ CD4 T cells were isolated and stimulated with anti-CD3/CD28 beads for a total of 4 d. (A) Surface expression of GARP was assessed by flow cytometry using a monoclonal anti-GARP Ab (gray). Isotype control is indicated as thin line histograms. GARP mRNA and miR-142-3p expression were analyzed by real-time PCR. Relative expression is demonstrated compared with expression of RNU6B. For protein expression, one representative of six independent experiments with similar outcome is shown. For mRNA and miRNA expression, means ± SD of three experiments are shown. (B) Cells were transfected with 250 nM scrambled or specific antagomir of miR-142-3p at day 1. Surface expression of GARP was assessed by flow cytometry using a monoclonal anti-GARP Ab. GARP mRNA expression was analyzed daily by real-time PCR. miR-142-3p expression was assessed 1 d after transfection. One representative experiment is shown for surface GARP staining. Means ± SEM of at least three independent experiments are shown. (C) Cells were transfected with 250 nM miRNA mimics of miR-142-3p or scrambled miRNA at day 0. Surface expression of GARP was assessed by flow cytometry using a monoclonal anti-GARP Ab. GARP mRNA expression was analyzed daily by real-time PCR. miR-142-3p expression was assessed next day after transfection. One representative of the nine independent experiments with similar outcome is depicted. Means ± SEM of at least three experiments are shown. Statistical analyses were performed by a Student t test. *p < 0.05, **p < 0.01, ***p < 0.001. To evaluate whether this rise of miR-142-3p causes downmodulation of GARP expression, we assessed the effect of an antagomir to miR-142-3p on GARP expression in cells transfected just before the miR-142-3p expression peak at day 1 after stimulation. The antagomir delayed the downmodulation of GARP expression (Fig. 4B). The effect of miR-142-3p blockage was obvious on both surface protein and mRNA expression. An ∼2-fold reduction in the miRNA expression underpinned the downmodulation. Alternatively, when cells were treated with a mimic of miR-142-3p before activation, the upregulation of GARP expression was markedly diminished as observed again on protein as well as on mRNA level (Fig. 4C). It was supported by an ∼4-fold increase in the miRNA level in response to transfection with the miR-142-3p mimic. Taken together, these observations demonstrate that upregulation of miR-142-3p in response to activation correlates with GARP expression on CD25+ CD4 T cells and confirm miR-142-3p as the miRNA controlling endogenous GARP expression in CD25+ CD4 T cells in response to activation. To provide insight into the biological function of miR-142-3p in CD25+ CD4 T cells, we again interfered with the biological activity of the miRNA by using an antagomir or mimic of miR-142-3p and, in addition to GARP expression, followed the proliferative capacity of the cells in response to activation (Fig. 5). Antagomir treatment of CD25+ CD4 T cells resulted in an immediate reduction of miR-142-3p expression level and a subsequent upregulation of GARP mRNA and protein expression throughout the follow-up period (Fig. 5A). The proliferation of CD25+ CD4 T cells treated with an antagomir to miR-142-3p upon stimulation was modestly but significantly increased (Fig. 5A). In contrast, treatment of the cells with a mimic of miR-142-3p led to a reduction of proliferation accompanied by an increase in miR-142-3p level and a diminution of GARP mRNA and protein expression (Fig. 5B). Involvement of miR-142-3p in proliferation of CD25+ CD4 T cells. (A and B) CD25+ CD4 T cells were isolated. Cells were split for CFSE labeling. Both fractions, CFSE-labeled and nonlabeled cells, were transfected either with an antagomir (A) or with mimic of miR-142-3p (B) and stimulated for 4 d with anti-CD3/CD28 beads. Proliferation was assessed by flow cytometry in CFSE-labeled cultures. Numbers indicate the frequency of proliferating cells and the division index (DI). Nonlabeled cells were followed daily for GARP expression. Surface expression of GARP was assessed by flow cytometry using a monoclonal anti-GARP Ab. GARP mRNA expression was analyzed by real-time PCR. miR-142-3p expression was assessed 1 d after transfection. Means ± SEM of at least three experiments are shown. Statistical analyses were performed by a Student t test. *p < 0.05, **p < 0.01, ***p < 0.001. CD25− CD4 T cells do not express GARP physiologically but do express miR-142-3p to a level comparable to that of CD25+ CD4 T cells. 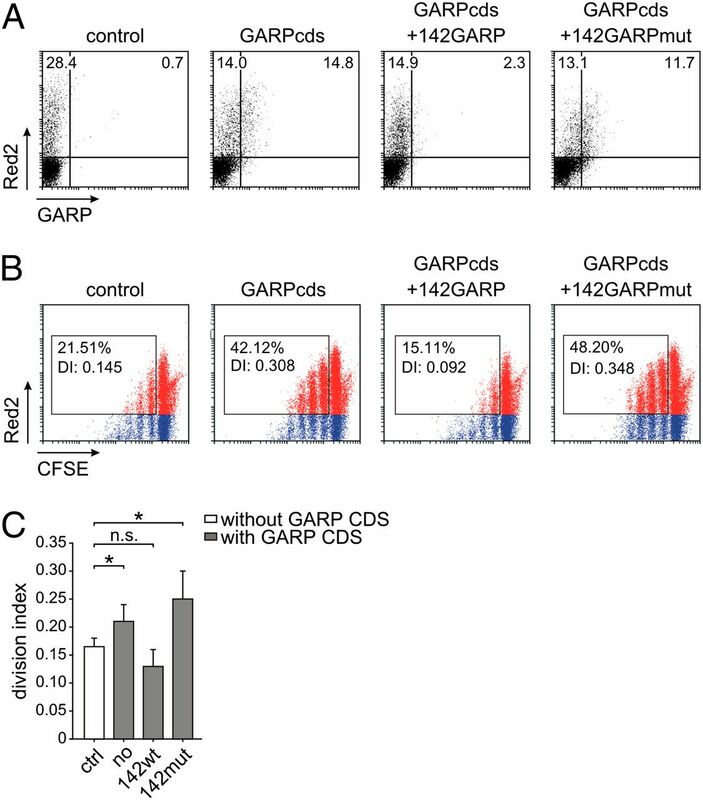 To verify the role of miR-142-3p/GARP interaction in T cell proliferation, we therefore analyzed proliferation of primary CD25− CD4 T cells in response to enforced GARP expression (Fig. 6). For this, we generated vectors containing the GARP coding sequence and downstream sequences of the wild-type or mutated GARP miR-142-3p MRE. Transfection of CD25− CD4 T cells with a vector encoding the naked GARP coding sequence led to ectopic expression of GARP on the surface of CD25− CD4 T cells (Fig. 6A). The presence of GARP miR-142-3p MRE downstream of the GARP coding sequence markedly reduced this ectopic GARP expression. Mutation of the MRE fully restored GARP expression. When the proliferative capacity of the transfected cells was analyzed, it became apparent that insertion of the GARP miR-142-3p MRE considerably diminished the proliferation of CD25− CD4 T cells ectopically expressing GARP (Fig. 6B, 6C). The presence of the mutated variant of GARP miR-142-3p MRE, however, did not affect T cell proliferation. These data correspond well with the observation that the interference with miR-142-3p biologic activity influences cell proliferation and indicate that the miR-142-3p–regulated GARP expression might in fact modulate proliferation of CD25+ CD4 T cells. Regulation of T cell proliferation by miR-142-3p via GARP. CD25− CD4 T cells were purified and labeled with CFSE to follow the proliferation or left unlabeled to control surface protein expression. Cells were transfected with vectors encoding the GARP coding sequence (GARPcds) alone or accompanied by the downstream wild-type or mutated sequence of miR-142-3p MRE from the GARP 3′UTR (142GARP and 142GARPmut, respectively). The vector without an insert was used as a control. To track the proliferation of transfected cells, T cells were cotransfected with pDsRed2-N1. CFSE dilution was followed in Red2-expressing cells at days 3, 4, and 5. (A) GARP surface expression 1 d after transfection is demonstrated. (B and C) CFSE dilution in proliferating cells at day 4 of cell culture is shown. Numbers indicate the frequency of proliferating cells and division index (DI) within the Red2-expressing population. Representative results (B) or means ± SEM of five independent experiments (C) are shown. Statistical analyses were performed by a Student t test. *p < 0.05. To explore the link between GARP and the proliferative capacity of cells in greater detail, we overexpressed GARP in different cell lines physiologically not expressing GARP, such as HeLa or Jurkat cells. Ectopic GARP expression did not influence the proliferation behavior of the cell lines (Fig. 7A). Remarkably, however, when the proliferating capacity of individual clones was examined, profound differences in cell growth of the clones expressing different amounts of GARP were observed (Fig. 7B, 7C). Clones expressing lower amounts of GARP on the surface proliferated slower than did those expressing higher amounts, as shown for three representative clones in Fig. 7B and 7C. The changes in cell growth of clones were reflective of a slowing of their cell cycle progression and of accumulation of cell cycle–inhibiting proteins p53, p21/Cip1, and p27/Kip (Fig. 7C). Next, we examined the impact of diminishing GARP expression in a high-expressing clone by transfection with a vector expressing GARP-targeting siRNA (Fig. 7D). Expression of GARP siRNA reduced the level of GARP and also suppressed the proliferative capacity as compared with clones transfected with scrambled siRNA. In contrast, it did not influence the proliferative capacity of GARP-nonexpressing control cell lines. These observations confirm that diminishing of GARP expression attenuates cell proliferation. GARP modulates cell proliferation. (A) HeLa or Jurkat cells were transfected with a vector encoding the GARP coding sequence and selected for stable transfectants. The vector without insert was used for generation of control cell lines. GARP expression was confirmed by flow cytometry. The proliferative capacity of the generated cell lines was assessed on a daily basis by cell counting. (B) The proliferative capacity of individual Jurkat clones was analyzed in relationship to their GARP expression level. Statistical analysis was performed by Pearson linear correlation test. (C) Based on the extent of GARP expression, individual cell clones expressing high, intermediate (int), and low amounts of GARP on the surface were selected from a GARP-expressing HeLa cell line. The proliferative capacity of the clones was determined daily during 10 d. To compare cell cycle progression, clones were synchronized in the late G1/S phase by double thymidine blockade. The DNA content was determined by flow cytometry after thymidine release. To evaluate expression of cell cycle–inhibiting proteins, Western blot analysis of cellular extracts from GARP-expressing HeLa clones was performed. (D) HeLa cell lines stably transfected with a GARP cDNA-encoding vector or a control vector were transfected with pcDNA6.2 vectors encoding in silico–designed siRNA targeting GARP or an irrelevant scrambled sequence and GFP for siRNA expression tracking. GFP+ cells were analyzed for GFP and GARP expression by immunofluorescence microscopy (original magnification ×40). The proliferative capacity of clones transfected with scrambled siRNA or GARP siRNA was determined by cell counting. Data are shown as means ± SD or as one representative of at least three independent experiments. Statistical analysis was performed using ANOVA. *p < 0.05. In this study, we dissected miRNA regulation of GARP expression in CD4 CD25+ T cells. We identified miR-142-3p as the miRNA facilitating GARP mRNA incorporation into the Ago2-associated RISC and initiating its subsequent degradation. miR-142-3p, therefore, regulates the short time window during which GARP is present on the surface of regulatory T cells after their activation. Because GARP appears to be involved in the proliferation of CD4 CD25+ T cells, this mechanism might represent a means to control regulatory T cell homeostasis, as neutralization of miR-142-3p resulted in increased proliferation. miRNAs represent a mechanism for posttranscriptional regulation of the expression of thousands of mRNAs enabling customized gene expression in different cell types as well as uniform expression within each cell type. The current models of the mode of action of miRNAs consider among others a binary off switch to dampen protein output (19). The observations concerning GARP and miR-142-3p expression in our study fit this model. Comparing the expression of GARP mRNA with that of miR-142-3p revealed a sequential expression pattern of GARP mRNA and miR-142-3p. Whereas miR-142-3p expression peaked at 48 and 72 h after stimulation, the initial rise of GARP mRNA was already detectable 4 h after TCR triggering (Supplemental Fig. 3), peaked at 24 h, diminished at 48 h, and was completely absent at 72 h after stimulation. The sequential expression of GARP mRNA followed by miR-142-3p is supportive of a role for this specific miRNA in regulating expression of its target and is consistent with the theory of a mutually exclusive interplay between miRNA and its targets proposed originally in Drosophila (33). Based on RNP IP results, we propose Ago2-mediated GARP mRNA degradation as the cause for the sequential presence of both counterparts. Interestingly, miR-142-3p is abundant already in nonactivated CD25+ CD4 T cells. miRNA/target interactions, in which an miRNA is already present when the target is first expressed or upregulated, is currently accepted as an evolutionary requirement for a more stringent threshold of transcriptional activity to reduce gene expression noise during cell fate decisions (34). The damping mode of action of miR-142-3p might therefore yield a strong repression of protein output to an inconsequential level in nonactivated cells by antagonizing the transcriptional activity of the GARP gene, as has been proposed for some other miRNAs (19). Indeed, CD25+ CD4 T cells transfected with an antagomir to miR-142-3p directly after activation express much higher levels of GARP. The 3′UTR of GARP is remarkably long (∼2000 bp) and contains five highly conserved sequences. Depending on whether dampening of protein output was beneficial, inconsequential, or harmful, the miRNA recognition sites were conserved, neutral, or selectively avoided during evolution. Usually not only the miRNA-targeting sites but also sequences in their vicinity are highly conserved throughout evolution (19). The miR-142-3p MRE is located in the distal 187-bp-long conserved segment that shares 76.2% homology with the mouse GARP 3′UTR. The miR-142-3p MRE itself differs in only two nucleotides between human and mouse sequences. Experimental interference with biological activity of miR-142-3p in mouse T cells yields similar effects on GARP expression as in human T cells (Supplemental Fig. 4). Collectively, these considerations indicate an important biological function for this miRNA in the posttranscriptional regulation of GARP expression. Besides miR-142-3p, a number of miRNAs were predicted by in silico analysis of this region to be capable of mRNA recognition. However, only miR-142-3p was regulatory in CD4 T cells. The conserved region surrounding MREs is thought to be necessary for engagement of RNA-binding proteins that play a key role to ensure successful miRNA regulation by either masking the miRNA recognition sites at distinct developmental stages and preventing miRNA-mediated repression, or by changing the RNA structure and thereby inducing the binding of miRNA and subsequent miRNA-mediated repression, or by stabilizing miRNA/mRNA complexes (35–38). It seems that there is no control of the activation-induced miR-142-3p–mediated GARP repression via an RNA-binding protein. In nonactivated CD25+ CD4 T cells, however, interaction of miR-142-3p with GARP mRNA might conceivably be influenced by this kind of regulation mechanism, as both miR-142-3p and GARP mRNA are present simultaneously. The list of miR-142-3p putative targets consists of hundreds of genes. Because of so many targets, it is difficult to assign the function of a specific interaction of miR-142-3p with GARP mRNA with absolute certainty and to rule out indirect effects. Indeed, 18 additional predicted target genes for miR-142-3p could be identified to be part of cell cycle processes codified by gene ontology analysis. An approach to discount such concerns is to disrupt the putative miRNA/mRNA interaction either by using antisense reagents, or by mutation of the binding site, or by perturbation of the binding site by homologous recombination (19). Mutation of the miR-142-3p MRE either individually or in the context of GARP 3′UTR identified miR-142-3p as the miRNA posttranscriptionally controlling GARP expression on CD25+ CD4 T cells. By using an antagomir to miR-142-3 we augmented endogenous GARP expression in CD25+ CD4 T cells, which was accompanied by an increased proliferative capacity of the cells. Both findings strongly argue for the observed proliferation phenomenon as a direct consequence of the interaction of miR-142-3p with GARP mRNA, and they decrease the hypothetical concern of indirect effects. This is further supported by the finding that mimics of miR-142-3p diminished GARP expression associated with decreasing cell proliferation. Finally, miR142-3p was able to modulate proliferation of primary CD25− CD4 T cells ectopically expressing GARP when the specific MRE was present downstream of GARP but failed to do so when the MRE was mutated. These data strongly argue for a direct role of miR142-3p/GARP interaction in regulating CD4 T cell proliferation. Given the association between GARP expression and CD25+ CD4 T cell proliferation, a tight regulation of GARP expression and therefore the mechanisms regulating its expression might be a prerequisite of functional regulatory T cell homeostasis. It is conceivable that nonactivated CD25+ CD4 T cells, which are not strongly proliferative and expand only homeostatically to keep the population stable, express low levels of GARP. Following specific stimulation, Ag-specific regulatory T cells expand. Thus, they upregulate GARP on their surface and initiate expansion. Through the miR-142-3p–mediated GARP mRNA degradation pathway, however, they downregulate GARP expression and ensure controlled expansion. Originally GARP has been reported to serve as a receptor for the nonactive form of TGF-β (20, 21). The biological function of a receptor exposing TGF-β in its nonactive form on the surface of regulatory T cells is, however, not completely understood, as no conversion into the active form occurs (21). Nevertheless, downmodulation of GARP expression by siRNA resulted in attenuation of the suppressive capacity of regulatory T cells (20), highlighting the necessity of GARP for regulatory T cell function. Our data provide an alternative explanation for GARP function in regulatory T cells, as the mechanism controlling their expansion although the precise molecular mechanism is also still elusive. Slowing the cell cycle in combination with expression of cell cycle inhibitors p53, p21/Cip1, and p27/Kip could contribute to the influence of GARP on cell proliferation. The exact connection between GARP and these molecules requires additional investigations. The finding that the GARP gene is an oncogene often amplified in various solid tumors (24, 28, 29) supports our hypothesis of an important role of the GARP/miR-142-3p interplay in controlling cellular proliferation and function. Importantly, however, the GARP effect on proliferation is modulating rather than absolute, although this effect may be critical in tumor cells, as deregulation of GARP expression contributes to their aggressiveness. The tight regulation of GARP expression through miR-142-3p might, therefore, create a short time window during which GARP is abundant on the surface of regulatory T cells, permitting the initiation and, alternatively, subsequent dampening of their proliferation to prevent their unopposed outgrowth. Although intriguing, our data are suggestive and further in vivo studies will verify the role of miR-142-3p/GARP interactions on T cell homeostasis in a living organism. We thank C. Schnabel for expert technical assistance. We thank Dr. G. Meister and Dr. M. Beitzinger for providing anti-Ago Abs and helpful technical advice. We are grateful to Dr. V. Heissmeyer for fruitful discussions and critical comments. This work was supported by Deutsche Forschungsgemeinschaft Grants SK59/4-1, Schu 786/2-5, and Schu 786/8-1; by Sonderforschungsbereich Grant 571 (Autoimmunity), project D9; by Deutsche Forschungsgemeinschaft Training Grant GK1202 (Oligonucleotides), project E2; and by the Verbundanträge “ArthroMark” (Projects 1 and 7, Grant OIEC100913) and “Impam” (Project 10, Grant OIEC1008H) of the German Federal Ministry of Education and Research. 2004. MicroRNAs: genomics, biogenesis, mechanism, and function. Cell 116: 281–297.
. 2007. Regulation of microRNA expression: the hypoxic component. Cell Cycle 6: 1426–1431.
. 2004. Micromanagers of gene expression: the potentially widespread influence of metazoan microRNAs. Nat. Rev. Genet. 5: 396–400.
. 2003. Dicer is essential for mouse development. Nat. Genet. 35: 215–217.
. 2007. MicroRNA functions. Annu. Rev. Cell Dev. Biol. 23: 175–205. 2008. MicroRNAs and the immune response. Trends Immunol. 29: 343–351.
. 2005. T cell lineage choice and differentiation in the absence of the RNase III enzyme Dicer. J. Exp. Med. 201: 1367–1373.
. 2005. Aberrant T cell differentiation in the absence of Dicer. J. Exp. Med. 202: 261–269.
. 2008. Dicer ablation affects antibody diversity and cell survival in the B lymphocyte lineage. Cell 132: 860–874.
. 2007. miR-181a is an intrinsic modulator of T cell sensitivity and selection. Cell 129: 147–161.
. 2007. miR-150 controls B cell differentiation by targeting the transcription factor c-Myb. Cell 131: 146–159.
. 2007. Regulation of the germinal center response by microRNA-155. Science 316: 604–608.
. 2007. Requirement of bic/microRNA-155 for normal immune function. Science 316: 608–611.
. 2010. The microRNA miR-182 is induced by IL-2 and promotes clonal expansion of activated helper T lymphocytes. Nat. Immunol. 11: 1057–1062.
. 2006. A role for Dicer in immune regulation. J. Exp. Med. 203: 2519–2527.
. 2008. Dicer-dependent microRNA pathway safeguards regulatory T cell function. J. Exp. Med. 205: 1993–2004.
. 2001. The leucine-rich repeat as a protein recognition motif. Curr. Opin. Struct. Biol. 11: 725–732.
. 2008. Identification of a regulatory T cell specific cell surface molecule that mediates suppressive signals and induces Foxp3 expression. PLoS ONE 3: e2705. 2009. MicroRNAs: target recognition and regulatory functions. Cell 136: 215–233.
. 2009. GARP (LRRC32) is essential for the surface expression of latent TGF-β on platelets and activated FOXP3+ regulatory T cells. Proc. Natl. Acad. Sci. USA 106: 13445–13450.
. 2009. Membrane protein GARP is a receptor for latent TGF-β on the surface of activated human Treg. Eur. J. Immunol. 39: 3315–3322.
. 2006. Array-comparative genomic hybridization to detect genomewide changes in microdissected primary and metastatic oral squamous cell carcinomas. Mol. Carcinog. 45: 721–731.
. 2009. Pharmacogenomic approach for the identification of novel determinants of acquired resistance to oxaliplatin in colorectal cancer. Mol. Cancer Ther. 8: 194–202.
. 2007. Array CGH identifies distinct DNA copy number profiles of oncogenes and tumor suppressor genes in chromosomal- and microsatellite-unstable sporadic colorectal carcinomas. J. Mol. Med.(Berl.) 85: 293–304.
. 1997. Detailed map of a region commonly amplified at 11q13→q14 in human breast carcinoma. Cytogenet. Cell Genet. 79: 125–131.
. 2004. Amplification of the BRCA2 pathway gene EMSY in sporadic breast cancer is related to negative outcome. Clin. Cancer Res. 10: 5785–5791.
. 2003. 11q13 alterations in two cases of hibernoma: large heterozygous deletions and rearrangement breakpoints near GARP in 11q13.5. Genes Chromosomes Cancer 37: 389–395.
. 2003. Combined array comparative genomic hybridization and tissue microarray analysis suggest PAK1 at 11q13.5-q14 as a critical oncogene target in ovarian carcinoma. Am. J. Pathol. 163: 985–992.
. 2003. Gene amplifications associated with the development of hormone-resistant prostate cancer. Clin. Cancer Res. 9: 5271–5281.
. 2011. Experimental identification of microRNA targets by immunoprecipitation of Argonaute protein complexes. Methods Mol. Biol. 732: 153–167.
. 2009. miR-142-3p restricts cAMP production in CD4+CD25− T cells and CD4+CD25+ TREG cells by targeting AC9 mRNA. EMBO Rep. 10: 180–185.
. 2004. Human Argonaute2 mediates RNA cleavage targeted by miRNAs and siRNAs. Mol. Cell 15: 185–197.
. 2005. Animal microRNAs confer robustness to gene expression and have a significant impact on 3’UTR evolution. Cell 123: 1133–1146.
. 2006. Denoising feedback loops by thresholding: a new role for microRNAs. Genes Dev. 20: 2769–2772.
. 2007. RNA-binding protein Dnd1 inhibits microRNA access to target mRNA. Cell 131: 1273–1286.
. 2010. A Pumilio-induced RNA structure switch in p27-3′ UTR controls miR-221 and miR-222 accessibility. Nat. Cell Biol. 12: 1014–1020.
. 2007. Roquin represses autoimmunity by limiting inducible T-cell co-stimulator messenger RNA. Nature 450: 299–303.
. 2006. Relief of microRNA-mediated translational repression in human cells subjected to stress. Cell 125: 1111–1124.